For people with a penchant towards thinking, analyzing, studying and solving different problems, a challenging puzzle might just be the right type of gift. What better way to spend one’s time on a cozy and warm evening at home, with a nice cup of tea and, perhaps, near a fireplace? Below you will find a selection of some of the coolest puzzles to choose when getting a present for somebody with an analytical mind, who takes pleasure in a challenge. A great option for getting a puzzle as a gift is this 3D, 540-piece set. 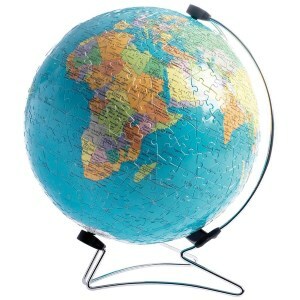 Depicting the globe with vivid colors, it features pieces that are very well crafted and perfectly curved, so that the person assembling them encounters no hassles. 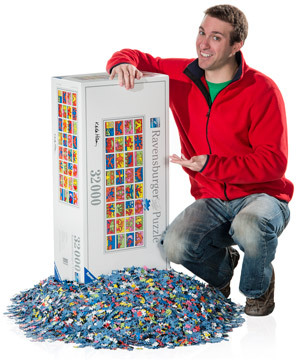 After all, Ravensburger is a well-known name in the puzzle-making industry; therefore, shortcuts and compromises are guaranteed to be left aside. The product requires no glue when assembled, and it also features a plastic base and a metal rotation stand. The inclusion of the two accessories makes it a perfect choice for accessorizing a home or an office. Beautiful and unique set, created especially with those geography buffs in mind. The color scheme is dominated by light brown and off-white, contributing to the resemblance with a map drafted somewhere in the Middle Ages. The 1000 pieces are guaranteed to keep you on your toes and occupied, given that the difficulty of the set is quite elevated. The product comes with free puzzle glue, and it is boasted to have an exact fit between the pieces. An interesting aspect is that the producer, Educa, offer a free replacement for any piece that is lost or missing in their puzzles. Boasting that their products rate among the sturdiest 3D puzzles on the market, Wrebbit 3D put a great deal of effort in providing detail and quality to theirs. This effort justifies, in part, the price; the other part is given by the notoriety of Harry Potter. 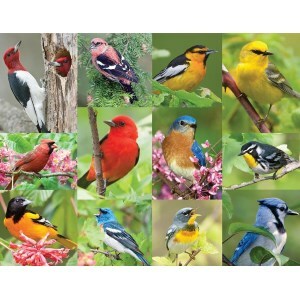 Lovers of birds (and puzzles), rejoice! This set would really please you, were you to receive it as a present. It features 36 jigsaw puzzle pieces made out of 100% recycled materials, with ink made of sustainable organic soy. The pieces themselves represent beautiful photos of birds taken in nature, and the quality of the puzzle is indeed exquisite. For those wondering about the small number of puzzle pieces and the relative ease with which this set can be put together, it’s important to note that its primary customers are people with memory problems and impairments, due to advanced age. Another beautiful puzzle made with eco-friendly materials and soy-based ink is this 1000-piece set. 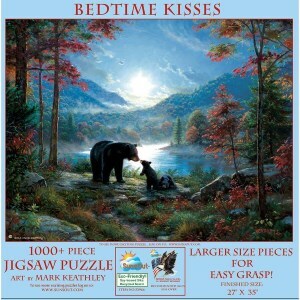 Depicting a gorgeous landscape having at its center a mama bear and her two cubs, the puzzle can be an inspired choice for a gift also destined to little children. Depending on one’s available spare time, the imposing number of pieces is guaranteed to keep the recipient busy for five or six days (or nights, before bedtime). A noteworthy aspect as to quality is that the pieces fit together snugly, making for a superb wall decoration, for instance, once the puzzle is completed. Go for it! 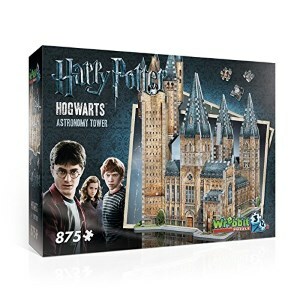 This set includes an impressive number of 1500 pieces, depicting a famous German historical landmark, the beautiful Neuschwanstein Castle. Built by the Bavarian king Ludwig II in the 1870-1880s, it is one of the most renowned of his construction projects. The puzzle is masterly crafted, with the pieces fitting very well. 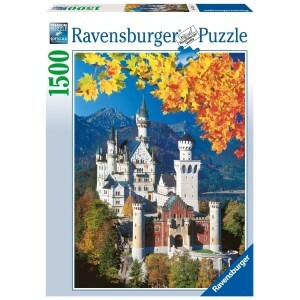 As mentioned above, Ravensburger is perhaps the oldest puzzle making firm in Europe, fitting their product with their own specially-engineered cardboard and the picture with glare-free properties. Also, the cutting process of the pieces continues to rely on hand-crafted tools, making this a unique gift for anyone. Although technically not a puzzle, the product stands out on this list. 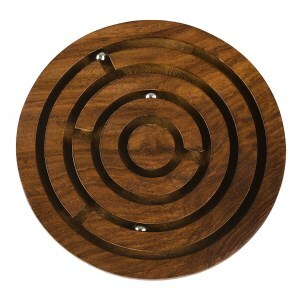 Crafted out of Indian Rosewood (or Shisham wood) by artisans who master the traditions present in rural India, it consists of a wooden board in which deep grooves are carved, in the form of a circular labyrinth. In these groves, three small metal balls roll around; the purpose of the game is to bring the three balls to the center of the board. The origins of the product, as well as its challenging nature for eye-hand coordination and general concentration, make it a good gift option. 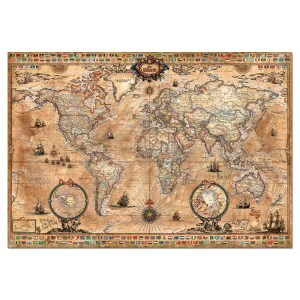 Puzzles come in various styles that are so appealing not only to children but adults, as well. From landscapes to three-dimensional puzzles, people like to put the pieces together and exercise their skills. This kind of activity has tremendous benefits on your brain because it improves your hand-eye coordination and your attention for details. 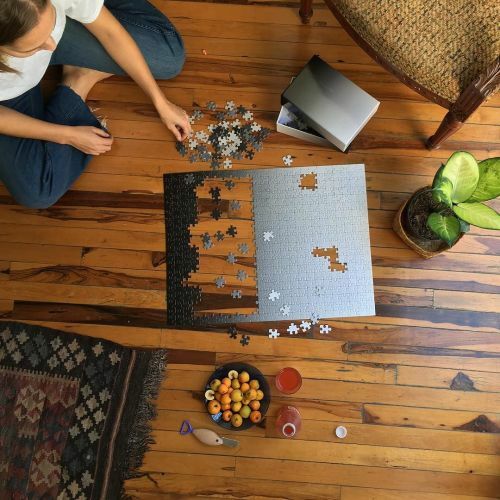 If you need some distraction from the TV, computers, smartphones and other modern life distractions then finding cool puzzles for adults will help you focus on something educational and entertaining. Cool puzzles can be tricky, and many people don’t enjoy games that take some time to complete while others are quite fond of jigsaw pieces that are tricky. If you need to purchase awesome puzzles with certain levels of difficulty and don’t know how to choose them, let an expert give you some hints. You need advice from someone that has already done the research and knows how puzzles work. There are some specific aspects you should be aware such as complexity, type of puzzle and personal preferences. But with the help of a well-crafted buying guide, you won’t have any difficulties in finding the right puzzle. You can’t imagine how many types of puzzles you can choose from. The variety is based on these features, and if you use them as pointers, we guarantee that you’ll put your hands on the coolest puzzles for adults that don’t run from a challenge. The first thing you’ll notice on every puzzle box for sale is the number of pieces. The larger the number, the more time you’ll spend finishing it. While simple puzzles don’t go more than 1000 pieces, larger ones can go up to 6000 pieces and more. Adults enjoy spending more time on assembly and get enjoyment from sorting thousands of pieces together. If you like puzzles with many pieces, you don’t have to solve it by yourself. Ask other friends to come and help you and organize puzzle parties and get them involved in these type of activities. The challenge is to finish a puzzle in one session otherwise you’ll end up losing track until the next gathering. The level of difficulty is measured by the number of pieces a puzzle has and the image you have to solve. Cool jigsaw puzzles for adults require a great deal of skill and coordination compared to the ones intended for children. Puzzles require more attention if the number of pieces is increased and their shape is more intricate. If you’re buying puzzles for yourself, then you should challenge yourself and search for the ones that have complex photos with small details because those are difficult to solve. On the other hand, if you’re buying puzzles as gifts then you shouldn’t opt for tricky pieces because you don’t want to give them something they don’t can’t solve. Unless they are puzzle gurus and love to solve them weekly. Sometimes you have tons of fun doing simple puzzles. This happens because you can get more people involved even the ones that are afraid to make a fool of themselves. Genuine puzzlers know that the level of enjoyment increases substantially if you share your passion with others. Maybe a puzzle is too complex for you to create the original photo but with a friend’s help or someone from your family you might share some laughs and finish sooner than you thought. The reason puzzles are so appealing is that it gives you an opportunity to recreate a picture, a famous paint or a breathtaking scenery. You should not choose a puzzle based solely on the number of pieces but consider the photo as well. Having an interesting picture to assemble is way much fun for all adults alike. Knowing their area of interests makes it much easier to select a proper puzzle. If you need ideas for cool puzzles for guys you should consider adding variety to your option instead of going with classic cars or architectural wonders. You can go with animals, cartoon characters or action figures. Although grown up, many men still have a soft spot for childhood memories and love to solve puzzles that involve recreating their favorite TV show or movies. There’s always the possibility to invest in puzzles that have an educational side besides entertainment. Not only children enjoy puzzle maps or history related ones, but adults are quite fond of using their intellectual abilities to put pieces together. A good way to keep your mind sharp is to spend your leisure time doing puzzles that offer you a possibility to learn something new or remember things you’ve learned in school. You might be tempted to think that puzzles are all the same but in reality, they target different age range and skills level which makes them a good gift option for birthday parties or Christmas. Adults love puzzles because it reminds them that they still have an inner child who is eager and passionate to solve things. Puzzles come in two major categories, Mechanical Puzzles, and Jigsaw Puzzles. The first ones can be described as objects that have a variety of parts that need to be put together in order to make something logical. Each part is connected with another one, and you need to guess which one goes where. These are a great option for adults but require only one person to solve the problem and are harder than Jigsaw puzzles due to the lack of picture. The second type requires the assembly of a number of interlocking pieces that result in a complete photo. In addition, there are three-dimensional puzzles that don’t form a classic flat picture but are fitted instead in 3D mode. And there are electronic puzzles found on the Internet or special apps that you can download and solve anytime you have some moments to spare.